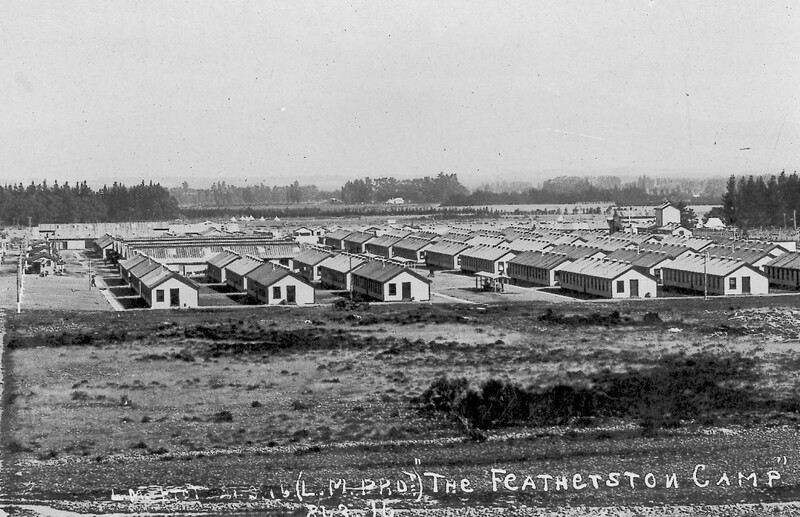 A view of the huts at Featherston Military Training Camp, looking north to south. In January 1916 New Zealand’s biggest army training camp opened on the main road between Featherston and Tauherenikau. It covered almost 30 hectares and was the biggest settlement in the Wairarapa at a time when Masterton’s population was 5,500. When World War One began in, most hoped the war would not last long. By the end of 1915 it was clear that fighting would continue and more trained soldiers would be needed. Trentham Camp was overcrowded and a new site was chosen near Featherston. The permanent accommodation of the camp was designed and built between August 1915 and January 1916 by 1000 men. 30 tonnes of nails were used on the 250 buildings. The camp was lit by electric generators and used the latest design for the 90 barrack buildings. Water was carried through 10 kms of steel pipes and there was 5 kms of roading.